Today’s post is dedicated to the thousands of people who officially end their Whole30 programs today. You may be asking yourself, “Am I really ready for this to be over?” You may be thinking, “I’m a little afraid of what Day 31 looks like.” Or maybe you’re just thinking, “I cannot wait to have my chocolate/wine/pizza/bread.” Either way, this post is for you. A universal truth: making good food choices is easy when you’re following the Whole30 “rules”, but much harder out there in the real world. We’ve talked to many a workshop attendee about this very topic (usually after they’ve fallen face-first into a box of doughnuts post-Whole30). The rules of the Whole30 program are very specific and completely non-negotiable. They narrow your (food) world and remove some of the stress of making your own food choices. The program also gives you an easy fall-back when faced with social or peer pressures. For many, the rules of the Whole30 function much like training wheels on a bike, giving you all the support and back-up you need while allowing you to complete the program under your own power. 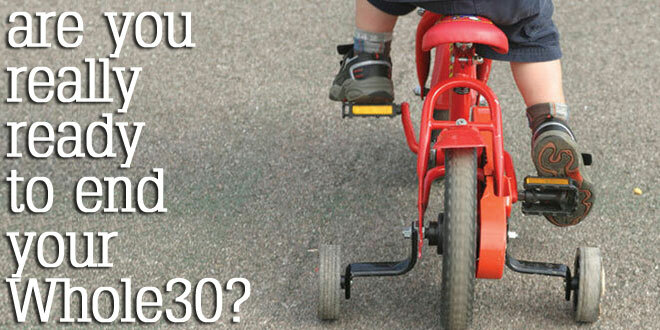 But are you prepared to ride your big-kid cycle when your 30 days are up? Your buy-in to the program also affords you a sense of community on our site and Facebook, even if it is virtual. You feel stronger, braver, more committed to your efforts when you know there are thousands of people doing the program with you, overcoming the same challenges you face. In addition, you’ve got a built-in excuse for why you don’t want that piece of cake or a glass of wine. “I can’t, I’m on the Whole30″ is your quick-draw response, your get-out-of-jail-free card when faced with social pressures. Yes, for 30 whole days, you get to give up the responsibility of making good food choices to us, and the rules we’ve set for you during your program. And for some, that feels wonderfully freeing. But what happens when your 30 days are up? All the comforts of our rules, your built-in excuses, your sense of being a part of something bigger than yourself disappear with the end of your Whole30. Which leaves you with the desire to continue to eat healthfully, but no clear plan to make that happen. In many cases, nervous about re-entry into the “real world”, people decide to extend their program to a Whole60 or Whole90 – we’ve even heard of a few Whole100’s or more. But we’d ask you to think twice before making that decision. Sometimes, extending your Whole30 is the right thing to do. For those who haven’t yet banished serious cravings, or who are coming out of serious metabolic derangement, injury or illness, we often encourage them to take their Whole30 just a bit further, to allow ample time for the body to right itself again. We hear many, many reports that participants didn’t really feel the “magic” until day 45, or even day 60. So if you’re still battling sugar and carb cravings or addictions, if you still have an unhealthy relationship with food, if you are still suffering from a disease or condition that will require more than just a month to improve, we encourage you to stick with the program as long as you need to see the results you are looking for. After all, what’s another two weeks, if it gives you a lifetime’s worth of health? However, extending your program is NOT the right choice for those who are simply nervous about handling real life all by themselves. You can’t – and shouldn’t – live within the strict parameters of the Whole30 forever. Yep, at some point… you’ve gotta take the training wheels off the bike. The point of the Whole30 is to gain awareness – figure out how foods you used to eat are actually affecting you; create new habits, patterns and relationships with food; and learn to apply that knowledge in everyday, real-life scenarios for the rest of your life. The program isn’t meant to continue forever – it’s a tool to give you the knowledge and confidence to make good choices on your own. Think of the Whole30 like your dietary training wheels, giving you the support and structure you need while learning. And despite the fact that it’s scary to lose the structure and comfort of our “rules” and take on the big, bad, sugar-laden world all on your own – at some point for each of you, it’s simply gotta happen. Here’s what most of you Whole30’ers can expect after your program is over. (Note, this is generalization, but also based on feedback from hundreds of people.) You’ll perhaps wait a day or two before reintroducing anything off-plan, nervous about taking that first step. Eventually, you’ll reintroduce some not-so-healthy foods, feel like crap and easily set them aside in favor of the usual Whole30-ish foods for your everyday meals and snacks. But slowly, eventually, inevitably, old habits and poor choices will start to creep back in. It might take a month, or two, or three… but eventually you will wake up and realize that (a) you’ve somehow slipped back into so-so eating habits, (b) you don’t feel very fantastic any more, and (c) it’s really time to clean things up. Does that mean you’ve failed your post-Whole30 test? Not at all! Habits are hard to break, pressures are hard to resist and the temptation of delicious, unhealthy foods are everywhere. In the real world, it’s easy for things to backslide from “awesome” to “so-so”, and it happens to everyone – even us. And it will, at some point, happen to you. So there you have it – the worst thing that could happen post-Whole30. You eat some crappy food for a while and feel not so hot. Big deal! All you have to do to regain that awareness, reset those good habits and remind yourself how amazing clean eating makes you look, feel and perform is to jump back on the Whole30. And contrary to popular sentiment, you don’t always have to do the program in full! There’s no reason why you can’t jump back on for a weekend, a week, two weeks… just long enough for your body and your brain to remember how good you feel, how delicious healthy food tastes, and how easy it is to feed yourself well. Once you’re back on solid ground, kick off your training wheels again. See? Easy. One of the best parts of our program is that each one of your Whole30’s build on top of the last one. This means as you stay connected with our program, your awareness, and your food choices, your periods of slipping back into bad habits will grow shorter and less frequent, and your clean-eating adventures will grow longer in duration (and easier). Your “cheats” will become more benign (think hummus and white rice instead of pizza and beer), your everyday meals and snacks will be effortlessly clean, and when you do choose to go off the rails, it will be easy to immediately right yourself and get back on track. And of course, should some special occasion, vacation or stressful event push you right off your bike, the Whole30 will always be there to give you some support and get you riding again. So for all you Whole30’ers, be prepared for us to push your bike on down the road. You can always come back and see us if you should happen to fall down.